Ah the final day. I did not want to leave Cambodia. Instead I wanted to head into the interior and explore the whole. But alas, I had to get back to China and work. On this final day, Mr. Kong and I headed to Roluos Group. Bakong was our first stop and it was impressive with its largess yet I must say a bit hard to capture in photos. There was a Buddhist temple next to the ruins with a full monastery attached, surrounded by a moat with boats. We then headed to Lolei – a small temple being refurbished. The surrounding area was lush with tall Bodhi trees. There was also a working monastery next to the ruin. Before exploring Preah Ko, I wandered through the craft stalls across the streets. There was a group helping orphans. The orphans were making art out of buffalo skins and weaving. It was a bit odd, as the orphans were mostly young kids who should be in school, but instead were laboring at making products for sale. Didn’t seem as ‘charitable’ as the signs said. I also spoke with Dr. Praeung. He had been painstakingly creating replicas of the temples at Angkor Wat for decades. He would start out by counting steps and rows and spires… then drawing it all exactly. Then building molds that ultimately created a miniature of the original temple(s). Some of his replications took over a year to create. He was a man that believed in preserving history and sharing it with future generations. Preah Ko was my last stop. It was really petite and pretty. A tight group of temples that gave a sense of calm and wonder. It was a nice ending to an amazingly full three days of temple hopping. Although I was tired, I still very much wanted to learn more about the country and continue my explorations. 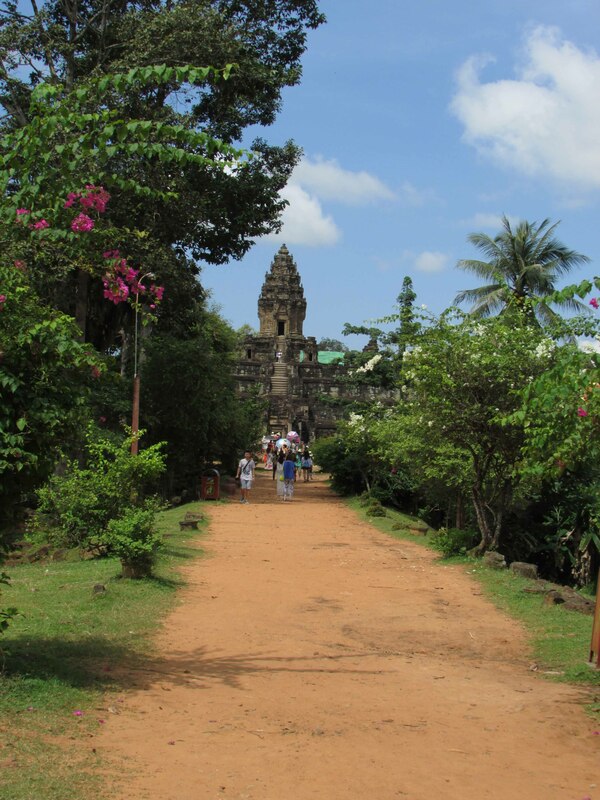 We then headed back to Siem Reap. I said goodbye to my wonderful Mr. Kong and walked into the town center where I had my final diner on the second floor terrace of the wine bar called “Sunshine.” It was a perfect spot to watch the town come alive as the pink dusk settled into darkness. I do hope some of the photos have enticed you to visit this wonderful place. The people were soft and warm and the beauty of the country was never-ending.